By nathanieltkacz, May 10, 2011 at 12:35 am . About the book: For millions of internet users around the globe, the search for new knowledge begins with Wikipedia. The encyclopedia’s rapid rise, novel organization, and freely offered content have been marveled at and denounced by a host of commentators. Critical Point of View moves beyond unflagging praise, well-worn facts, and questions about its reliability and accuracy, to unveil the complex, messy, and controversial realities of a distributed knowledge platform. The essays, interviews and artworks brought together in this reader form part of the overarching Critical Point of View research initiative, which began with a conference in Bangalore (January 2010), followed by events in Amsterdam (March 2010) and Leipzig (September 2010). With an emphasis on theoretical reflection, cultural difference and indeed, critique, contributions to this collection ask: What values are embedded in Wikipedia’s software? On what basis are Wikipedia’s claims to neutrality made? How can Wikipedia give voice to those outside the Western tradition of Enlightenment, or even its own administrative hierarchies? 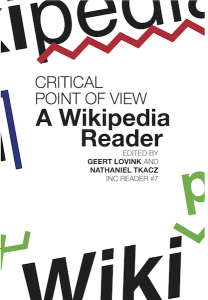 Critical Point of View collects original insights on the next generation of wiki-related research, from radical artistic interventions and the significant role of bots to hidden trajectories of encyclopedic knowledge and the politics of agency and exclusion. Contributors: Amila Akdag Salah, Nicholas Carr, Shun-ling Chen, Florian Cramer, Morgan Currie, Edgar Enyedy, Andrew Famiglietti, Heather Ford, Mayo Fuster Morell, Cheng Gao, R. Stuart Geiger, Mark Graham, Gautam John, Dror Kamir, Peter B. Kaufman, Scott Kildall, Lawrence Liang, Patrick Lichty, Geert Lovink, Hans Varghese Mathews, Johanna Niesyto, Matheiu O’Neil, Dan O’Sullivan, Joseph Reagle, Andrea Scharnhorst, Alan Shapiro, Christian Stegbauer, Nathaniel Stern, Krzystztof Suchecki, Nathaniel Tkacz, Maja van der Velden. Colophon: Editors: Geert Lovink and Nathaniel Tkacz. Editorial Assistance: Ivy Roberts and Morgan Currie. Copy-Editing: Cielo Lutino. Design: Katja van Stiphout. Cover Image: Ayumi Higuchi. Priner: Ten Klei, Amsterdam. Publisher: Institute of Network Cultures, Amsterdam. Supported by: The School for Communication and Design at the Amsterdam University of Applied Sciences (Hogeschool van Amsterdam DMCI), the Centre for Internet and Society (CIS) in Bangalore and the Kusuma Trust. At the end of project the INC needs to report to the funders of a project. Download the full report here with all the blogposts gathered. Full report of the CPOV, Wikipedia conference.